The MFC-8690DW offers powerful features ideal for any small/medium business or workgroup. 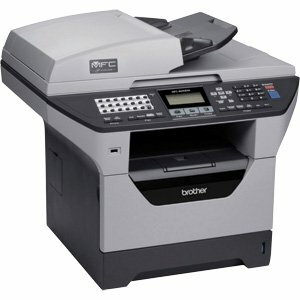 It features two-sided printing plus automatic two-sided scanning using the auto document feeder for copying, scanning and faxing. In addition, its advanced capabilities allow you to scan documents to a file, image, OCR, E-mail, FTP site or E-mail Server or use the USB Direct Interface? to print from or scan files to your USB flash memory drive. Built-in wireless 802.11b/g and Ethernet interfaces allow you to share this all-in-one with others. Plus, a 8,000-page high-yield toner cartridge is included to help lower your operating costs. Advanced duplex capability. Help save paper and reduce costs by printing two-sided documents and booklets. Plus, two-sided scanning using the auto document feeder for copying, scanning and faxing. Fast printing and copying. Produces high-quality output at fast print and copy speeds of up to 32 pages per minute. Flexible connectivity. Built-in wireless 802.11b/g and Ethernet network interfaces allow you to print, scan and PC fax over the network. Plus, Hi-Speed USB 2.0 and Parallel interfaces are included for local connectivity. Large, expandable paper capacity. Features an adjustable, 250-sheet capacity paper tray, a 50-sheet capacity multi-purpose tray plus an optional 2nd 250-sheet capacity paper tray to increase your total paper capacity to 550 sheets.